"Ethernet communication solutions offer access to the most widely deployed networking system. The TCP/IP protocol, which is at the core of this technology, allows total location independence and interoperability to any embedded application.". "The emerging standard for flexible wireless networking specifically designed for embedded control. ZigBee supports stars, clusters and mesh networks of up to 64k nodes. 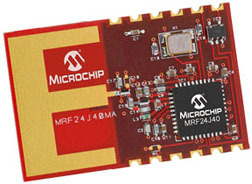 Microchip supplies a free stack that supports a variety of transceivers."